CosRx Advanced Snail 96 Mucin Power Essence - Sssnaillll! This is a light essence made with snail mucin to plump up your skin. It looks like there's enough here to last at least a week, probably more if you're like me and a tiny dollop is enough to cover your entire face. CosRx is a popular and trusted brand so I'm excited to see what this can do for me. 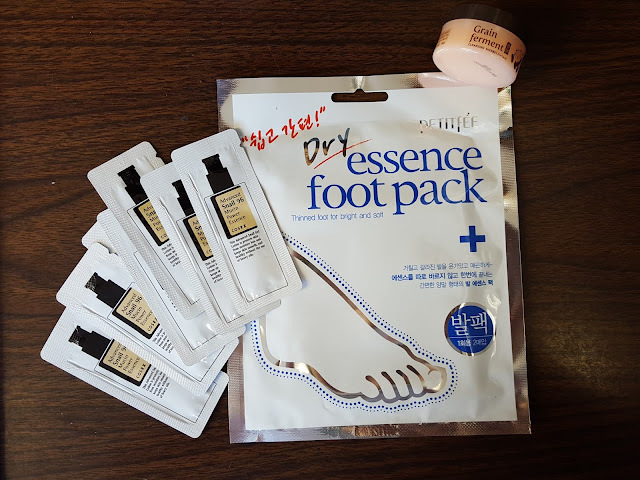 Petitfee Dry Essence Foot Pack - I'm a sucker for anything dealing with feet because mine are pretty gnarly. They're constantly cracking and I don't know why because I wear shoes everyday. So moisturizing masks, foot peels, whatever it is...I'm all over it. This foot mask contains sunflower oil, shea butter, aloe vera extract, glycerin, sodium hyaluronate, and even some snail amongst other moisturizing ingredients. These things are dry processed and get absorbed as they melt with body temperature. Hm. So these feetsie treatsies are in a powder form or something? Sounds interesting, I'll have to try it. Like now. 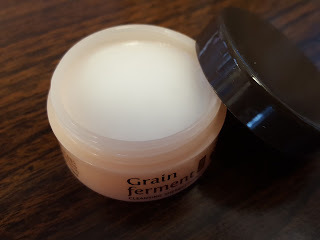 Botanic Farms Grain Ferment Cleansing Sherbet - I've always been a fan of sherbet-style makeup removers because they work soooo well. This one even has fermented rice bran for skin brightening. Although it's marketed as a makeup remover, I'd probably use it as a cleansing oil/sherbet as well and just follow it up with a foaming cleanser. The photo below shows what it looks like inside the container; it's solid in the jar but once you spread it around your face it melts into an oil to extract makeup and other oil-based impurities. 3W Clinic Collagen Whitening Essence - This essence is a two-parter: it has marine collagen, Japanese apricot extract, and licorice extract to soften and freshen skin, and it also contains niacinamide for brightening and reducing blemishes. Collagen is a big molecule and can't get through your skin, so that part of this essence is useless. Fortunately, niacinamide can be absorbed and it can also help to stimulate collagen and ceramide production to give you soft and supple skin. 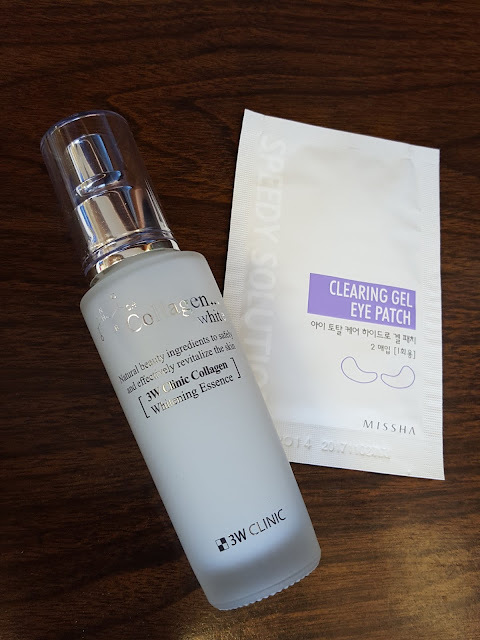 Missha Speedy Solution Clearing Gel Eye Patch - These patches contain glycerin, trehalose, and sodium hyaluronate and are supposed to plump up your undereye area after a single use. I've never actually tried one of these patches before; I'm waiting for a day when I get uber dark circles under my eyes but haven't had any. I guess that's a good thing? Wow, lots of essences this month. 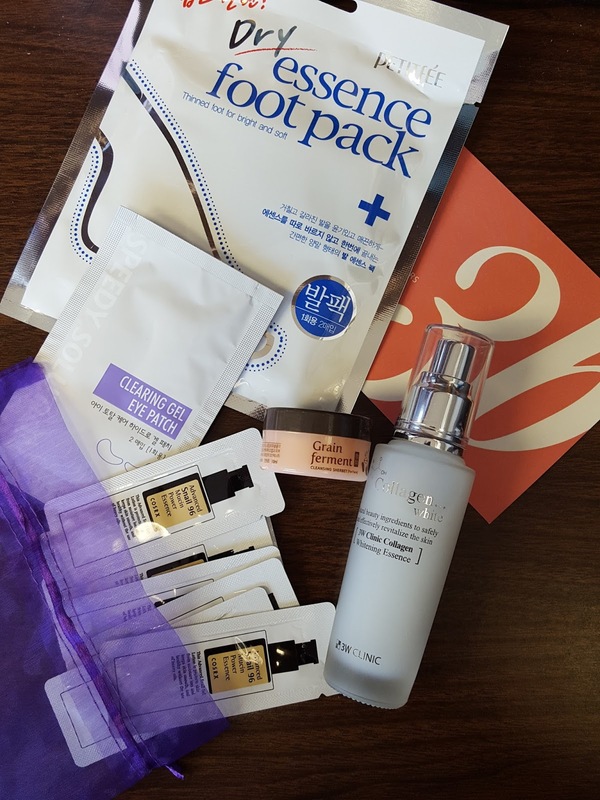 I'm most excited to try the dry foot pack because my feet are screaming for some TLC. My husband calls them dinosaur feet for a reason. :-/ So this month I'm going to have moisturized feet, eyes, and face. I wish there was a hand mask in here too because they've been cracking lately but oh well, hand cream will do for now.